If you go to the supermarket today you’ll see aisles full of Easter eggs and those Easter eggs will be choc (ha!) full of milk. 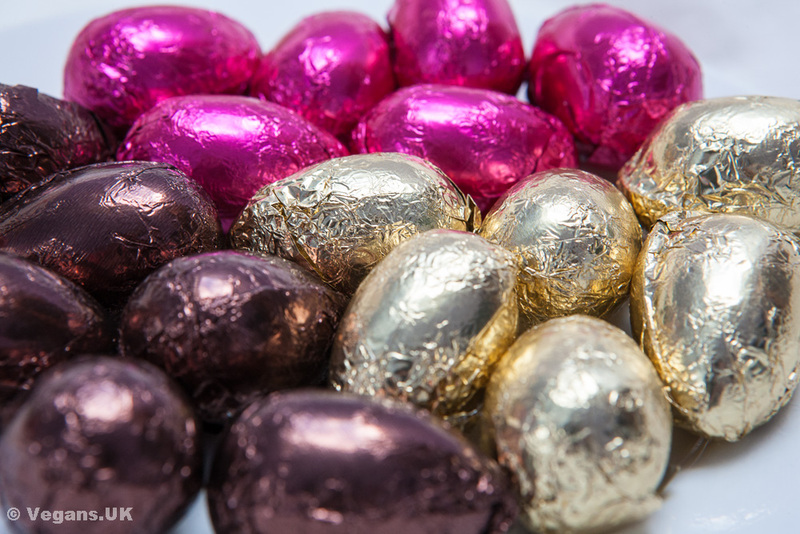 Even many of the lesser-spotted dark chocolate mainstream eggs contain milk. Some don’t (for example the delectable Green and Black’s Organic Dark Chocolate Egg) but mostly you’ll be looking in the ‘free from’ section for cruelty free Easter treats. So, I thought I’d make a huge sacrifice and test some of them for you. I know, selfless. I didn’t test a lot as: a) My jeans are tight enough already and, b) Happily, there are now a huge variety, with practically every major retailer in the UK catering to the lactose intolerant and of course vegans, so really, too many to sample. The first lot I tried were from the superb online retailer Vegan Town. The mini eggs came in three truffle filled varieties: strawberry flavour (gold wrapper) coffee flavour (brown wrapper) or nougat flavour (pink wrapper) and I must say all were yummy. They were the perfect size for an Easter egg hunt and you can buy them in a bundle as I did or in separate bags of one flavour. Next, the company Choices has a variety of dairy free treats that are available all year round at plenty of supermarkets. I tried their white chocolate bunny, which is just as I remember white chocolate to be (although I must admit it’s been a while) – very sweet with a close texture that crumbles nicely as you eat it. The second of their products I tried was their caramel flavoured Easter Egg, which came with three chocolate discs. It was nice, but some of the chocolate in the main egg was a bit thin and the flavour was perhaps an acquired taste. It did a good job of imitating milk chocolate though and those shortcomings didn’t stop me munching my way through it, and it was great for something different. My favourite was probably Moo Free’s Orange Easter egg. The chocolate was nice and thick and the orange crystal bits through it (a bit like Matchmakers) were absolutely scrummy. It is a darker chocolate, but not so dark it’s bitter, so I think would appeal to milk chocolate fans too. It definitely disappeared the quickest and I was sorely tempted to go out and buy another one. Definitely a great egg to convert non-vegans! The holy grail of Easter treats is of course the Cream Egg. There’s been a bit of controversy recently about the quality of the mainstream egg, not that you’d want to eat dairy stuff anyway. So, hurray for Considerit Chocolate who have produced a vegan cream egg. Yes, you read that correctly, a Vegan Cream Egg. It goes without saying that when my local vegetarian deli got them in stock yesterday, I hot-footed it down there and bagged one. Screw the expense, I had to try it. The chocolate was darker than you’d have with the conventional one, but the filling was perfect and all in all I was not disappointed. They are so popular though, I’d get in there if I were you, before they all disappear. If you do miss out on those, remember, a dairy free Easter egg is only as far as your local supermarket because everyone from Sainsbury’s, to Holland and Barrett seem to have their own brands and the free from section will have everything from dark, ‘milk’, or white chocolate vegan eggs for you to choose from. So have a happy Easter and treat yourself!